How could a diet filled with so much cholesterol and fat be so good for us? Because many of the foods that we once thought were the problem — like eggs and meat — can actually be the solution. Below, we explore some of the healthiest keto foods. Let’s start off our top 10 list with a cholesterol-packed food that would make your mother gasp — eggs. Eggs are one of the healthiest and most versatile foods on the planet. Many experts even identify the egg as one of the only true “superfoods.” The reason behind this profound claim lies in the egg yolk, not the white. In fact, most of the beneficial nutrients in the egg are found in its yolk, including thirteen essential vitamins and minerals and the eye-protecting antioxidants known as lutein and zeaxanthin. They are also one of the best sources of choline, a vitamin-like essential nutrient and methyl donor involved in many vital physiological processes. Although egg yolks are high in cholesterol, consuming them doesn’t raise blood cholesterol levels in most people. Eggs have even been shown to modify the shape of LDL in a way that reduces the risk of heart disease. Egg consumption has also been found to increase the feeling of fullness and keep blood sugar levels stable, leading to lower calorie intakes for up to 24 hours. This could mean that eggs are the weight loss boosting superfood you’ve been waiting for. On top of that, one large egg contains less than 1 gram of carbs and fewer than 6 grams of protein, making it the perfect keto-friendly health food. Virgin olive oil and olives contain numerous health-promoting compounds. One of the most studied olive components is a phenolic compound called oleocanthal. Oleocanthal possesses similar anti-inflammatory properties as ibuprofen, which makes olives and virgin olive oil a great addition to the diet for anyone who wants to reduce pain and inflammation. A one-ounce (28-gram) serving of olives contains 2 grams of total carbs and 1 gram of fiber. This works out to a net carb count of 1 gram for 7–10 olives, depending on their size. If you don’t like olives or don’t want the net carbs they contain, then olive oil is a great option as well. Although you won’t get all of the benefits of olives by consuming olive oil, you will still get plenty of healthy fats and health-promoting compounds. If you are looking for a healthy cooking oil, extra virgin olive oil should be your staple. A recent study found this to be the healthiest oil for baking, cooking, and deep frying at high temperatures. This is because extra virgin olive oil contains a high-quantity of stable fats and antioxidants that protect the oil from breaking down into toxic chemicals. We commonly hear about how meat, poultry, and seafood are a high-quality protein source, but did you know that they contain essential nutrients that cannot be found in plant foods? For example, vitamin B12, a highly-absorbable form of iron, creatine, taurine, carnosine, and DHA all carry huge health benefits, but they can only be found in animal products. Fresh meat and poultry are packed with B vitamins and several minerals, including potassium, selenium, and zinc. They also contain varying levels of creatine, taurine, carnosine, and an easily absorbable form of iron. Even the fats in these meats are beneficial for health. One study in older women found that consuming a diet high in fatty meat led to HDL cholesterol levels that were 8% higher than on a low-fat, high-carb diet. This study also provides us with a deeper understanding of why the ketogenic diet has been found to improve cholesterol levels. To get the most health benefits from your meat, it is best to have 100% grass-fed pasture-raised red meat and pasture-raised poultry. Meat from animals that are raised in this way has been found to have healthier ratios of omega 3 to omega 6 fats and contain more antioxidants than 100% grain-fed animals. However, no land mammal can compete with the amount of anti-inflammatory omega 3s that you’ll get from fish and shellfish. Salmon, sardines, mackerel and other fatty fish are the highest in omega-3 fats, which is why many studies have found frequent fish intake to be associated with improved mental health and decreased risk of disease. Shellfish are extremely beneficial as well — providing us with an excellent source of zinc, copper, and vitamin B12. Despite how healthy they are, it is important to be mindful of how much shellfish you eat on the ketogenic diet. Some shellfish may contain more net carbs than you might expect. Another important caveat for keto dieters is that having too much meat or seafood at any given meal can decrease your ketone levels. For this reason, it is best to split up your protein consumption equally between meals if you want to maintain or increase your ketone levels. High-fat dairy also contains high-quality protein, vitamins, minerals, and conjugated linoleic acid (one of the few fatty acids that have been found to promote fat loss). The combination of these nutrients is essential for maintaining strength and function as we age. By adding just 7 ounces of ricotta cheese to their daily diet, for example, the older participants of a recent study were able to increase their muscle mass and muscle strength. In other words, ask for extra cheese, please. This guilty pleasure may be as pleasurable for you as it is for your health. For example, the cocoa in dark chocolate contains many flavanols that decrease blood pressure, heart disease risk, and insulin resistance. In fact, cocoa is known as a “super fruit” because it provides at least as much antioxidant activity as any other fruit (including keto-friendly berries). However, this doesn’t mean that you have a free pass at eating as much dark chocolate as you’d like, especially on the ketogenic diet. Many chocolate products contain enough net carbs to kick you out of ketosis. When buying chocolate or any cocoa product, read the label carefully to make sure it has no added sugars and a minimal amount of carbs per serving. If you don’t like the taste of dark chocolate, then try to find chocolates that derive their sweetness from healthy low-calorie sweeteners. There are hundreds of types of berries in the world, and all of them contain different anthocyanins, which are flavonoids responsible for their distinctive colors of red, blue, and purple. These flavonoids also have powerful anti-inflammatory effects. Wild blueberries, for example, have been found to improve memory in older adults, and other research suggests that they protect the brain from inflammation. Raspberries and blackberries are loaded with antioxidants that have been credited with reducing inflammation and protecting against disease as well. While you are on the ketogenic diet, it is best to consume berries in moderation due to their relatively higher net carb content. Garlic, onions, leeks, and other vegetables from the Allium family all contain allicin. This is a potent plant compound that activates anti-inflammatory and anti-oxidative activities throughout the body, protecting us from brain damage and disease. Garlic, in particular, has been used for centuries as a prophylactic and treatment for many diseases. It is rich in organosulfur compounds, which give it its potent flavor, taste, and health-promoting properties. Although alliums tend to be higher in net carbs than other low-carb vegetables, it is difficult to consume too many of these potent veggies. Feel free to use them in your cooking to enhance the flavor of your keto meals. Just make sure you are mindful of the net carbs you are getting from them. If you’d like to know exactly how many carbs are in allium vegetables like onion and leeks, read through our guide to the best low-carb vegetables for the ketogenic diet. All low-carb vegetables contain vitamins, minerals, fiber, and antioxidants that are essential for all aspects of our health. Cruciferous veggies, however, come with an extra health boost. Although they contain more vitamin K and A than many other vegetables, this isn’t why we put cruciferous vegetables on the list of top 10 keto foods. What gives crucifers like broccoli and cauliflower an edge over every other veggie is sulforaphane. Sulforaphane is a compound that is created when we crush or chew cruciferous vegetables. Once it is digested, sulforaphane activates a cytoprotective (cell-protecting) pathway that protects the cells from oxidative stress and removes toxins from the body. This is one of the main reasons why cruciferous vegetable consumption is linked to improved cognitive function and decreased cancer and heart disease risk. The best part is that you won’t have to climb to the top of a mountain or scavenge the Amazon jungle to reap the benefits of sulforaphane. All you need to do is eat popular veggies like broccoli, Brussels sprouts, cauliflower, and cabbage. Cruciferous vegetables are a saving grace for ketogenic dieters as well because they make great substitutes for higher-carb foods and stand-alone side items and snacks. For instance, cauliflower can be used to mimic rice or mashed potatoes and kale can be turned into crunchy, delicious chips. The clearest evidence of why saturated fats aren’t bad for us can be found in the studies on coconut oil — one of the most saturated fat filled foods you can consume. Take a recent randomized, double-blind clinical trial that compared coconut oil and soybean oil for example. In this study, the researchers found that coconut oil promoted a reduction in abdominal fat and kept blood lipids under control, while soybean oil caused an increase in total cholesterol and a decrease in HDL cholesterol. What’s even more fascinating is that coconut oil was also found to help obese adults lose weight and belly fat. One study, in particular, found that supplementing the diet of obese men with 2 tablespoons (30 ml) of coconut oil per day lead to an average loss of 1 inch from their waistlines. One of the reasons behind these health-promoting effects is a fat found in coconut oil known as MCTs or medium-chain triglycerides. Unlike long-chain fats that you’ll find in fatty meats and dairy, MCTs are taken up directly by the liver and converted into ketones. By increasing ketone levels, MCTs and coconut oil can help decrease calorie consumption, increase energy levels, and improve brain function. In fact, the MCTs in coconut oil can even improve the quality of life and cognitive function of people with Alzheimer’s disease, Parkinson’s disease, epilepsy, and other neurological disorders. Many studies have found frequent nut consumption to be associated with a reduced risk of heart disease, certain cancers, depression, and obesity. Nuts and seeds also contain plenty of fiber, which helps boost weight loss by increasing satiety. Seeds come with many unique benefits as well. Flaxseeds, for example, are the richest dietary source of lignan precursors, while sesame seeds offer the highest amount of phytosterols of all nuts and seeds. Both lignans and phytosterols are helpful in reducing inflammation, heart disease risk, and cancer risk. Consuming nut and seed oils on their own, however, is strongly advised against because they contain unhealthily high levels of inflammatory omega 6s. For this reason, it is best to consume whole or freshly ground nuts and seeds. Although all nuts and seeds are low in net carbs, the amount they contain varies quite a bit among the different types. If you get most of your calories from this list of top 10 keto foods, then you will get results (even if you don’t strictly follow the ketogenic diet). By eating each one of these foods throughout the week, you will be able to cover your macronutrient and micronutrient needs, while losing fat and feeling better than ever. However, it is important to know that these aren’t the only health-promoting keto foods. There are plenty of other keto-friendly ingredients that can take your keto diet results to the next level. In my diet, for example, I’ve been experimenting a lot more with shirataki noodles and avocado lately. They have been providing a much-needed change of pace for my palate and my health. Shirataki noodles are the closest thing to keto pasta that I’ve come across. They are primarily made up of a viscous fiber called glucomannan and contain less than 1 gram of carbs with 5 calories per serving. Despite their low-calorie content, the fiber and water in the shirataki noodles make them very filling. They can even help you stay full between meals because their fiber will slow down the movement of food through your digestive tract. These unique qualities are what make shirataki noodles ideal for anyone who wants to cut their calorie consumption without starving themselves. Shirataki noodles come in a variety of shapes, including rice, fettuccine, and linguine, so that you can substitute it for any of your favorite high-carb pasta recipes. When I am in a rush, I occasionally throw these noodles together with some pasta sauce, MCT oil, and pre-cooked bacon for a quick keto meal. If you’d like to learn more about this “miracle” pasta alternative, check out our comprehensive article on shirataki noodles. Avocados are an essential part of the ketogenic diet, especially in the beginning. This is because avocados are high in several vitamins and minerals, including potassium. By increasing your potassium intake, you can help relieve many of the symptoms of the keto flu during the first few days of keto. Regarding your long-term health, avocados have been found to help improve cholesterol and triglyceride levels. One study, for example, found that an increase in avocado consumption led to a 22% decrease in “bad” LDL cholesterol and triglycerides and an 11% increase in “good” HDL cholesterol. One-half of a medium avocado contains around nine grams of carbs, but seven of these are from fiber. This means that each half only has 2 grams of net carbs, which makes avocados a keto-friendly and healthy option. Not a fan of avocados? Try using avocado oil instead. Although you won’t get all of the vitamins and minerals that you would by eating a full avocado, the oil contains mostly monounsaturated fat. This unsaturated fatty acid helps improve cholesterol levels and is stable enough to withstand high temperatures during cooking and baking. If the bulk of your calories come from these foods while you are on the ketogenic diet, then you will be able to experience all of the benefits of restricting carbs. 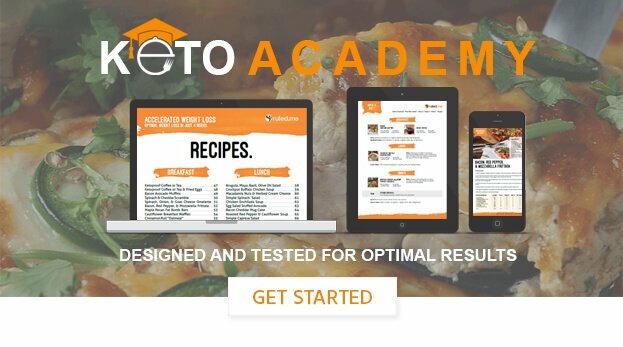 Simply put, the ketogenic diet + the 12 keto foods in this article = rapid fat loss, improved overall health, enhanced brain function, and decreased risk of various diseases.